As you know, I’m not keen on ye olde swedee. My veg box scheme is quite basic – I don’t choose what comes, I get what’s available and that’s that, so they are going to keep on coming. There are schemes available that let you add extras to your box or take away things that you don’t like. In a way I quite like having no control about what arrives each week. It means my diet gets a shake up with nutrients from veg I might not have chosen to eat. However, I would still like to wave goodbye to swede! Goodbye, salam, auf wiedersehen, arrivederci, adios, au revoir, farvel . . .
(quelle horreur! ), and the newcomers: • Red pepper • Squash. Squash . . . But Which Squash?! The newcomers are very welcome. I’ve enjoyed all the squash I’ve tried before but I’m not entirely sure whether this one is a buttercup or Japanese kabocha. According to The Cook’s Thesaurus, both varieties are orange fleshed and described as ‘dry’, so there’s no clues there either. I guess I will work it out when I taste it, apparently the buttercup has ‘a sweet and creamy orange flesh’, while the kabocha ‘tastes of sweet potatoes’. They sound pretty similar to me and at the end of the day, who cares what it’s called – it’s a squash! I’m delighted to report that I’ve found a great new way to deal with the dreaded swede. When I opened the box this morning and saw this unwelcome visitor I decided I needed to find someone who would make it more welcome in their home. I texted my neighbour and asked if she liked swede and within minutes there was a knock at the door. Yay! My swede can now enjoy a happy life next door. Fantastic. So swedes are good for something after all – neighbourly relations. My veg arrives each Saturday morning in a cardboard box. It feels a shame to put these in the recycling when they could be used again, but there’s no information on Dairy Crest’s website or newsletters about taking them back for reuse. I will have to investigate . . . In each box there’s a newsletter. The newsletter includes a bit about the growing season and then features a couple of fruit or veg. The one I’m holding talks about broccoli and gives a recipe for Broccoli and Peanut Butter Soup. That doesn’t sound that appealing to me, but you never know ’til you’ve tried it. There’s also some history, nutrition info and a recipe for avocados. Ooh, I wish I had an avocado in my box, but it looks like they just appear in the salad boxes. I know this because on the backside of the newsletter it shows you what they are planning to put in their boxes next week. Looks like I could be in for swede again. Oh no! I don’t think I will ever get the taste for swede. This month I had my first-ever taste of Jerusalem artichoke. Apparently my dad loves these – and he also loves swede. I definitely didn’t inherit those tastebuds! I wish my parents lived closer because I would have happily handed them over. I don’t mind having the odd thing in the box that I don’t like. I just keep trying to cook them in different ways until I do like them. Though I think in the case of swede this is wishful thinking. I like the idea of eating with the seasons and seasonal food is exactly what you get with veg boxes. Food in season is tastier, more nutritious and probably hasn’t travelled so far to get to you. It also helps to support local farmers. When you’re in the supermarket it’s difficult to tell what the seasonal UK food is. Everything looks ripe and ready to eat. At first glance you can’t tell what’s been forced in hot houses or transported thousands of miles. Having said this, after two months I am looking forward to a few more different things appearing in the box. I’m ready for spring. As you know, I was lucky enough to win my weekly supply of organic veggies and the prize lasts a whole year. I was just browsing the site where I won the prize and I thought you’d like to know that the competition is still on! Eeek! It’s veg box day and I haven’t made it very far through the last box yet. I seem to have a glut of bean sprouts and onions, and decide that stir fries are made for days like these. I get out the biggest onion and the entire pack of bean sprouts then I notice that I still have the brussels, too. I chuck it all in the wok then add a couple of eggs at the end. I’ve run out of soy sauce so I grab the Worcester Sauce instead! Sometimes these ‘throw in whatever you got’ type of meals turn out to be the best, don’t they. This meal is OK. At least I know it’s healthy. But back to this week’s box. Sweeeeeeede . . . YARG! I’m happy this week that there’s a bit more green and a bit less root veg. I’m also happy to see red onions. Just look at the colour of them – they look fantastic. As a single person, it has been tough to get through five onions each week! There’s five again this week but at least they’re a bit different being red so I’ll be inspired to do something different with them. Right in the middle of the box this time I found my arch-nemesis lurking! The dastardly swede. I puff my cheeks out and wrinkle my nose at the thought of it. OOF! My veg box is delivered by the milkman and is left on my doorstep early on a Saturday morning. The veg arrives in a closed cardboard box, which I then put in my recycling. Some of the green veg has come in plastic bags, which I’m not too keen on, but mostly the loose veg has come in brown paper bags. The veg arrives pretty much in its natural state, not cut and squished into plastic with the air drawn out like in the supermarket. This veg also arrives with some of the mud still on, which I think is great. I love that earthy, just-out of-the-ground smell and it only takes a matter of seconds to wash off. Because it is not destined for the supermarket shelf, veg-box veg has the freedom to look a little different! It may be slightly larger or smaller, have a funny shape or sport splits or pits, but who cares? They grow how they grow – that’s the way it’s supposed to be. And there’s all the benefits of being organic, too, no pesky pesticides. This is definitely a great way to improve your diet. Along with the normal staples each week I’ve eaten things I never would have bought, I’ve liked things I thought I hated, and tried a few new things, too. By having a veg box, I’ve also eaten more colour than before and am starting to ‘eat a rainbow’. Different coloured veg have different vitamins and minerals in them so this is a good thing to try to do. All in all, my diet is having a bit of a shake up and that can only be a good thing. It’s veg box morning and I’m pleased to see a box of bean sprouts among the contents. Since my veg box scheme started I’ve got used to adding them to anything and everything, and now I’d miss them if they weren’t there. But hang on . . . what’s this? I take a photo of the strange knobbly thing in my box and email it to my mum who tells me it’s a Jerusalem artichoke. OK, new one on me! I guess I just treat it like any other root veg. Also in the box for the first time this year is broccoli. Yay, I love broccoli. The only problem is that, because there hasn’t been any broccoli up until now, I bought some yesterday. So now I have three heads to use up in a week. The broccoli in the box is a little on the soft side, too, so I should think of something to do with them fast. I guess that’s what happens when you don’t know what you’re going to get. 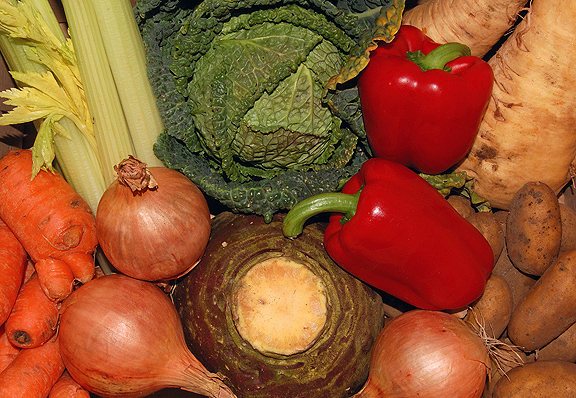 • Red-skinned potatoes (1Kg) • Onions • Carrots • Cabbage • Brussel tops • Parsnips • Cooked beetroot • Celery. Because you don’t know what you’re going to get, it’s always exciting to see what’s inside! As this is the third box I’ve started to see a pattern – it seems that potatoes, onions, carrots and cabbage are a regular fixture this season. 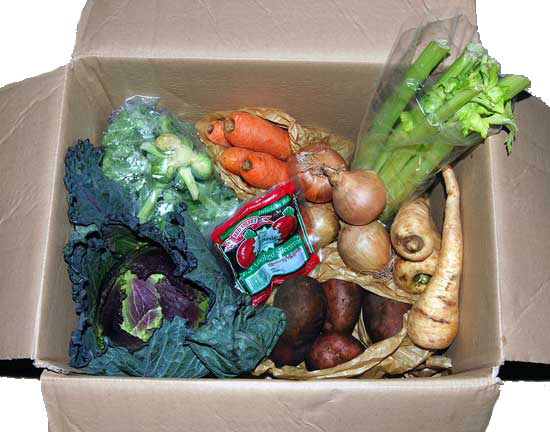 In this box I also have celery for the first time along with Brussels tops, cooked beetroot and more parsnips. Oh no! I haven’t finished the last parsnips yet. I’m not especially keen on parsnips, which is why they’ve been left until last, and I don’t know what to do with them. Then I remember my book Matthew Drennan’s Soup. This book packed with great soup recipes, but it also gives you recipes for accompaniments such as mini rosemary scones and pumpkin crisps. I like the idea of making vegetable crisps so I give it a go. This is easy – and you can make crisps out of all sorts of veg, including potato, parsnip, carrot, beetroot, pumpkin, sweet potato and plantain. First I poured olive oil into a saucepan until it reached a depth of about a centimetre. Then I peeled the skins off the parsnips, but kept the skins on the potatoes. Using a knife I cut very thin slices to make the crisps. You can use a peeler if you want really thin slices. The slices were fried in batches in the hot olive oil for 2–3 minutes or until golden and crispy. The fatter your slice, the longer you’ll need – unless you like chewy crisps. And if the slices overlap they may not cook properly. I fished out each batch of crisps with a metal spatula and set them on kitchen paper to drain while the next batch got fried. So . . . anyone for crisps? There’s loads to go around – you can get so many out of one large spud. They taste just like shop bought crisps, but fresher and without all the chemicals – and you can add whatever you want: salt and pepper, vinegar, cheese, garlic salt, celery salt, parmesan . . .
Next time I fancy crisps I know what to do.